William L. Smock founded our company in 1970, to better serve his customers by working with them directly, instead of as a sales engineer working under someone else. For the first decade of operation, we supplied engineered material handling systems like racking, shelving, order picking, and conveying systems. Originally, projects were designed by our engineers, with construction contracted out. But always, we made sure the systems achieved or exceeded the customer's requirements. 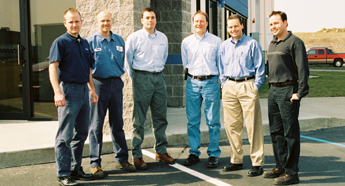 In these early years, we were able to grow, as customers realized the value that our engineering experience offered. Our work was even recognized by the industry, including Material Handling Engineering's "Value Added" award. In 1980, we established our own manufacturing facility, and began completing our projects in house. This allowed us to be even more creative in designing custom solutions. Now we could engineer, build and debug a system on our floor, allowing customers to try it out and fine tune it before having it installed in their plant. After another fifteen years of continued growth, we moved to our current larger facility in 1995. We now have room to build and test even more systems concurrently. Our founder is now retired, but before leaving, he made sure his sons are capable of continuing to meet customers' needs with innovative material handling systems.